Home / China / Conflict / Japan / North Korea / Nuclear / Nuclear Security / Opinion / South Korea / United States / Kim Jong-un’s Nuclear Ambition: What is North Korea’s Endgame? North Korea’s sixth nuclear test, following soon after a series of missile provocations, tells us a great deal. Most obviously, North Korea does not feel at all constrained by US President Donald Trump’s rhetoric, and nor has it been coerced by UN sanctions. It also illustrates the acute regional tension caused by the acceleration of the isolated country’s weapons acquisition program. While we wait for technical detail that will reveal the exact magnitude of the blast, and thus how close the regime has come to acquiring a viable nuclear weapon, it is important to try to determine just what it is that North Korea seeks in taking the risky, expensive and diplomatically fraught steps down the nuclear path. Determining intent in the mind of political leaders is always a fraught endeavor. Working out what the leader of a highly closed society like North Korea wants is harder still. On this question, there is little reliable information, and the best we have is educated guesswork. But discerning what Kim Jong-un wants from his nuclear gambit is necessary to determine how to respond to North Korea’s latest test. 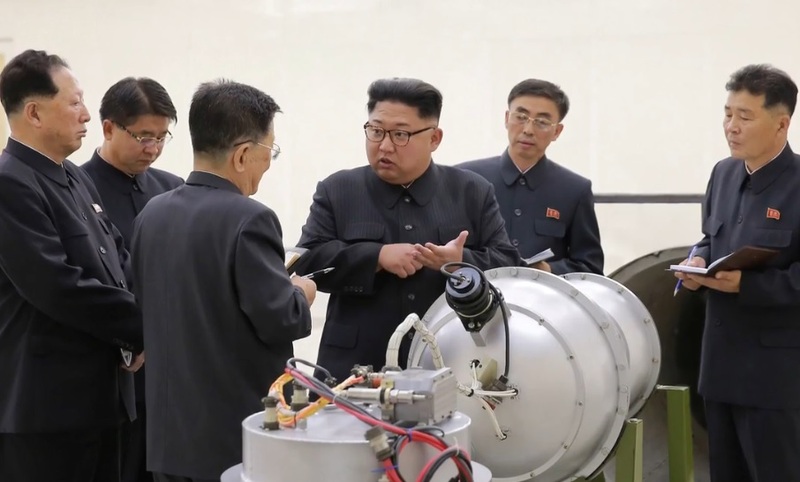 North Korea’s nuclear program began in the early 1990s, and in its first decade or so was often thought to be a means of extorting financial and material support. The Agreed Framework, established in 1994 to manage the crisis, looks in hindsight like a reward for stopping the country from behaving badly. Given how economically fraught North Korea’s existence had become after the Soviet Union’s collapse, nuclear blackmail as a means to remain viable had a certain logic. The tempo and success of the various tests show that North Korea’s nuclear program is not a creative revenue-raising exercise. For one thing, the country is no longer as economically fragile as it was in the 1990s. More importantly, the program is so far down the path of weapon acquisition that this motive can be ruled out definitively. If there were any doubts, the latest tests show North Korea is committed to acquiring a nuclear weapon that can hit the US and other targets both near and far. The reasons are as follows. Contrary to the way it is often portrayed, North Korea is motivated by the same concerns as all country. Above all, Kim wants nuclear weapons to increase the country’s sense of security. Due to their destructive force, nuclear weapons are thought of as the ultimate guarantee. The regime perceived that Iraq and Libya were vulnerable to regime change because they could not deter the US or other powerful countries. As a country that believes the US and its allies pose a significant threat, nuclear weapons are increasingly seen as the only way it can protect itself. While North Korea has a very large military – its defense force is comprised of nearly 1.2 million people – its equipment is badly outdated, and would perform poorly in a fight with US or South Korean forces. Nuclear weapons are thus a way to maximise the chances of regime survival in what North Korea thinks is a hostile international environment. The ability to confer disproportionate power on their owners bestows nuclear weapons with considerable prestige. North Korea wants to be taken seriously as a military power of the first rank. The only way in which it can achieve that ambition is through acquiring nuclear weapons. And while North Korea has been protected by China – it is the reclusive country’s only partner – it is also aware of the vulnerability that that dependence brings. An indigenously developed nuclear weapon promises security, status, and autonomy. Finally, Kim has made nuclear weapons a core part of North Korea’s identity under his leadership. The country’s constitution was amended in 2012 to describe North Korea as a nuclear-armed state. This was a clear statement of intent not only about getting the weapons but about their importance to North Korea’s political identity. They are intimately bound up with Kim’s leadership and his sense of North Korea’s place in the world. How to calibrate the response to North Korea has to start from recognizing the fundamental importance of the weapons to North Korea, and more particularly to Kim’s leadership. He cannot be bought off, and the desire to have a properly nuclear-free Korean peninsula is impossible for as long as he rules. All policy options are unpalatable but some are much worse than others. Regime change or some other coercive effort to stop North Korea comes with the risk of horrendous loss of life as well as no clear guarantee that it would work. Equally, cutting off the already very isolated country could cause it to collapse with millions of refugees. And more likely North Korea would figure out a way around any more strict sanction regimes, as it has done for many years already. The best-case scenario is a negotiation in which North Korea agrees to freeze its program. It would not hand over what it has but it would stop going any further. Yet even this is difficult to envisage, and politically would be very difficult for Trump to accept. The most important thing policymakers in the US, China, Japan and elsewhere can do now is begin to prepare for a North Korea with nuclear weapon capabilities. It is the most likely outcome given Kim’s ambitions and the very limited choices the outside world has. But while it would be dispiriting development, it would be likely to create a more stable environment than the volatile context created by North Korea’s sprint to the finish.